Diese Zusammenfassung gibt eine Schritt-für-Schritt Antwort für Firefox und Google Reader. RSS (Really Simple Syndication) has been around for a long time and is a very easy way to be notified of new content on a website. There are two ways you can check for new content on a website. The problem with the first way is if you browse to your favourite site and look for something new and it’s not there, you have wasted valuable time. This is especially so if you have many sites you regularly check. RSS is a much faster way for you keep up-to-date with new content, where new things from all your favourite sites come to you instead. 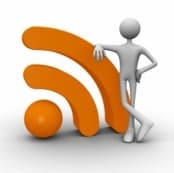 To subscribe to a site’s RSS feed you need an RSS reader. There are many RSS readers out there and I’m going to show you two. 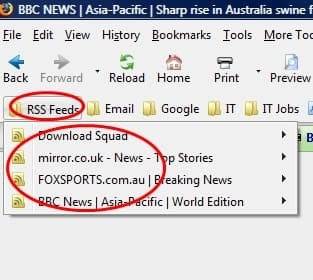 The Firefox browser has a built-in RSS reader. 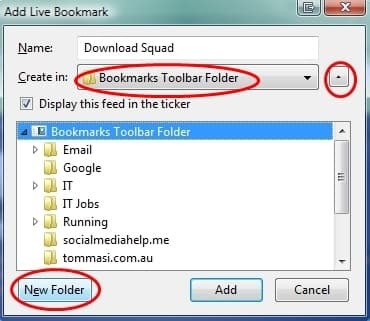 On the Add Live Bookmark pop-up, click on the down arrow, then click on the <New Folder> button. You have just created a new folder for your RSS feeds. You have just subscribed to that site’s RSS feed! Any new content from that site will now appear in the folder you have just created in your browser.. this folder will be dynamically updated with new content. Usually sites have their content in categories. For example, a sports site may have the following categories – Football, Boxing, Tennis, Basketball, etc.. with all related posts within each category. Often you can subscribe to the specific categories of a website. That way your feeds content is more granular. Once the category page has loaded, lookout for an RSS icon on that page that will allow you to subscribe to the feeds in this particular category. 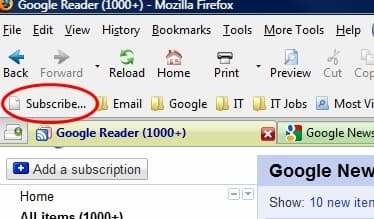 That is all you need to do to subscribe RSS feeds using Firefox! Unless you have a bookmark synchronisation tool, all you feeds are ’stuck’ within your browser. So if you logon to another PC, eg at work, then you won’t have access to your RSS feeds. 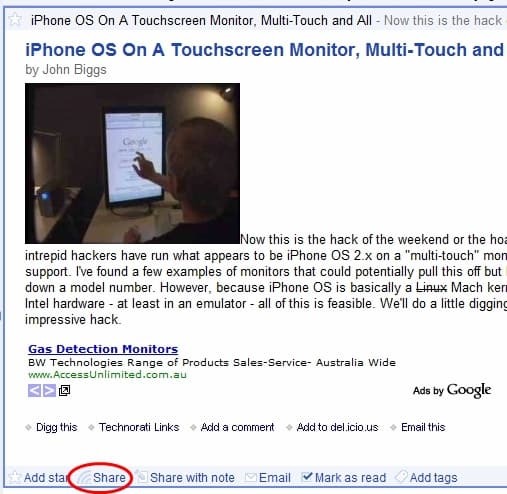 However, if you use an online RSS reader like Google Reader then you can access your feeds from anywhere. Google Reader is a lot more powerful than the one that comes with Firefox. It has many features which go beyond the scope of this post.. but I will show you two ways to subscribe to RSS feeds, as well as how to share your feeds. 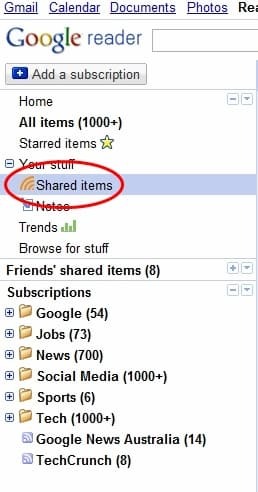 To get started you will need to sign-into or create a Google Reader account. 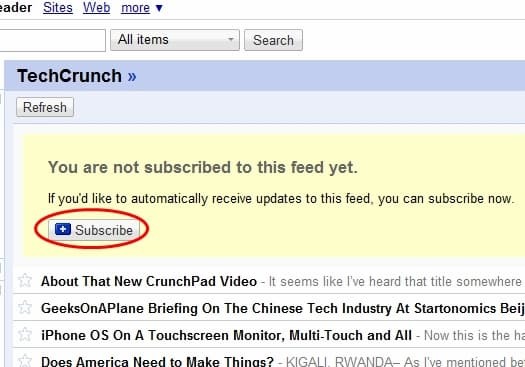 The second way (which I personally prefer and use) is to use the <Subscribe> button.. which firstly needs to be setup. Now browse to a site that you would like to subscribe to. You have just subscribed to this feed. Whenever you want to subscribe to a feed, just click on this button. The good thing with Google Reader is that you can share your RSS feeds to the world. Other people can subscribe to your shared RSS feeds.. and you can subscribe to other peoples shared RSS feeds. You could email this URL to your friends or they could subscribe to your RSS feeds directly from this page. As you can see RSS is a very easy way to bring content back to you.